The following text was scanned and OCRed from pp. 57-68 of the book MARTHA'S VINEYARD by Henry Franklin Norton. Copyright 1923 by Henry Franklin Norton and Robert Emmett Pyne, Publishers. 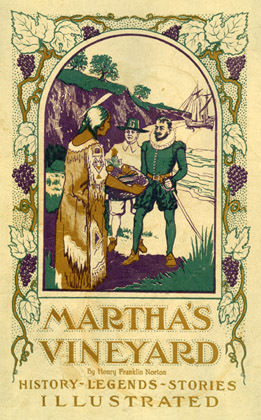 See also The History of Martha's Vineyard by H. F. Norton. To their haven under the hill. -- Tennyson. HE Indian name of the locality of Tisbury, or Vineyard Haven, was Nobnockett, which means in the Algonquin tongue, dry land. This land, one of the first places named by the white men, was called "Homses Hole," or "Holmes Hole," for we find in one of the first deeds, 1646, the following sentence: "The line is to goe from Tequanoman's Point to the Easternmost Chop of Homses Hole." Dr. Charles E. Banks, our Island historian, thinks that an old Indian chief might have lived there when the whites first came, for the word "homse" meant an old house or dwelling-place. Hence, it must have been the site of an old wigwam, for the whites did not settle or build there until sometime later. The town was named Tisbury for the English parish of Governor Thomas Mayhew, at the New York conference July 8, 1671, between Matthew Mayhew, grandson of Governor Mayhew, and Colonel Francis Lovelace, who represented the English Crown. The first white settler to live at Vineyard Haven was Francis Usselton, about 1660. He was forced to leave because he had made secret purchases from the Indians without the consent of Governor Mayhew. Usselton went to Newport, Rhode Island. Huzzelton's Head in Tisbury perpetuates his name. "I have languished the whole tedious week in the competition of us lovers and yet, madame, you have not vouchsafed to express the least compassion for my sufferings, although you are the cruel object of them. Why should beauty effect arbitrary sway, or take delight in ruin of the most faithful adorer? Or why should such a passionate heart as mine is be rewarded only with scorn and contempt ? O! let me conjure you by those dear killing eyes that have robbed me of my repose, to let me know my crime, and wherein I have offended you, that the whole service of my life should atone for my transgressions; and yet, madame, if you mean to make me your victim, do but let me know it, and I die with the eagerness and resignation of a martyr. For, alas! my despair has so effectually mortified me that, should you continue to be severe, death would be a welcome deliverer to the most unfortunate, Jabez Athearn." 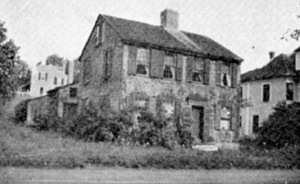 A tavern was kept by Ebenezer Allen, the father of Maria Allen, a Revolutionary heroine, and another by John Baxter, which was burned in 1762. The Claghorn tavern had one of the most interesting signs. It is on exhibition at the D. A. R. Hall. 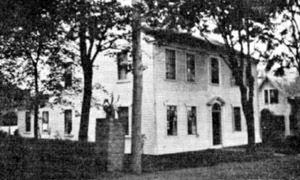 The Branscomb house on Beach Street was at one time a tavern, and in it were afterward located the first postoffice and library in Tisbury. It is now owned by Mrs. Evangeline Merrill Ritter, the Vineyard weaver. The village grew around these taverns and by the time of the Revolution there was a good sized settlement at Homses Hole. A large number of men from this part of the Vineyard were active in the French and Indian Wars under the leadership of Captain Peter West, who died of small pox at Fort Edward, near Lake George, in 1757. During the Revolution this harbor was the refuge for many British men-of-war. In 1775 the people of Homses Hole erected a "liberty pole" on Manter's Hill. As another expression of public feeling the women threw all their tea into the hole to show their attitude regarding the Boston Port Bill. A few months later the British ship Unicorn came into the harbor looking for a pole to replace a spar lost in a storm. The captain spying this "liberty pole" sent word to the selectmen that he would purchase "the pole on the hill;" and if they refused to sell it, he would consider it a rebellious act and fire on the town. The selectmen set a price, not daring to do otherwise, and the captain informed them that his men would take the pole the next day. Mr. Daggett, one of the selectmen, upon reaching home related this incident. His daughter Polly made no comment, but as soon as supper was over she went to Parnel Manter, a friend and told her the story. These girls made up their minds that the British could not have the "liberty pole." 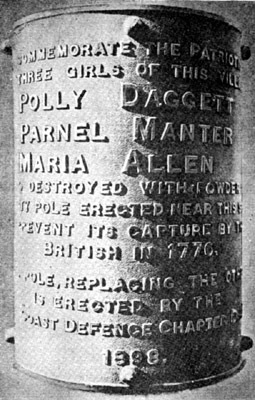 While the girls were trying to think of some way to save the pole from the British, Maria Allen came in. As the three girls were discussing a plan, suddenly one of them said: "I have an idea, let's blow up the pole." How this could be done was a great problem to the girls. Maria Allen said that there was a ship's auger in her father's shop; they could bore a hole in the pole and fill it with powder. Parnel Manter could borrow her father's powder-horn. Maria secured the auger, Parnel the powder-horn. Then the three girls started for Manter's Hill. They arrived at the pole and started to bore, each taking her turn. Two holes were made and filled to the brim with powder, Polly Daggett giving the hem of her woolen petticoat for wads. Everything now being in readiness, the question was how to ignite the powder. At last Polly solved the problem. She would get a beanpole from a neighboring field, tie the rest of her petticoat hem on it, set it on fire, and push it against the powder. Polly ran home and stole a warming-pan full of hot coals from the fireplace. The critical moment had arrived. Who would dare to touch it off? They lighted the cloth on the end of the bean-pole and all three shoved it against the woolen wads. After the third attempt the wads started to burn; then the girls dropped the bean-pole and ran for shelter behind an old barn. A second later there came a report like that of a cannon; then the splitting and crackling of the pole. The next instant came a second explosion which completely destroyed the pole, making it useless. The girls then hurried home, not mentioning the incident until many years after the war. The next morning the captain of the Unicorn sent then ashore to get the pole. When they saw the condition it was in they were furious and reported to their commander. The captain went to the selectmen only to learn that they were as puzzled as anyone about the affair. The Unicorn was finally obliged to sail away without obtaining the desired spar. FORMATION OF THE "SEA COAST DEFENCE"
Soon after the destruction of the "liberty pole" a company was formed comprising three commissioned officers, seven non- commissioned officers, and sixty-four privates under the command of Captain Nathan Smith. This company was made up of men from Tisbury and Chilmark and was stationed at West Chop. It was called the "Sea Coast Defence" because it defended the northern shore of the island. It was during the fall of 1777 that two vessels laden with supplies for the British, at this time stationed in New York, were captured in Homses Hole harbor. These stores were sent to Washington's army. Major-General Grey entered Homses Hole harbor September 10, 1778, in command of a raiding fleet of eighty-two ships. Brigadier Joseph Otis of Falmouth records the raid as follows: "They caryed off and Destroyed all the corn and Roots two miles round Homses Hole Harbour; Dug up the Ground everywhere to search for goods the people hid: even so Curious were they in searching as to Disturb the ashes of the dead. Many houses were all Riffled and their Windows were all broke." The following incident happened at Lambert's Cove. One day a squad of British soldiers came upon the home of an aged widow living alone with her little grandson Joseph, a lad of twelve years. In spite of the widow's prayers and entreaties to spare her living, they proceeded to take all of her live stocksheep, pigs and cows. As they were about to depart, a sergeant spied a sleek and well-fed grunter concealed beneath the old lady's petticoat. "Well, boys," he shouted, "you have left the fattest of the litter behind." Immediately several soldiers advanced to capture the coveted quadruped; but the good dame's prayerful tone was soon changed to one of rebellious defiance. Seizing a heavy broomstick she flourished it in the face of the enemy in a manner terrible to behold. "Away with ye, cursed seed of the oppressor; the despoilers of the widows and the fatherless! Take what you have of mine and begone; but this is Joie's pig and not a hair of him shall ye touch." Impervious to fear and pity, the iron-hearted men of war advanced upon the prize. The old woman's broomstick rattled among their bayonets at such a rate that they were fain to call a halt. The pig still stuck to its cover. The sergeant, handing his musket to a comrade, rushed in and attempted to seize the rebellious grandame by the waist. In this rash assault he received such a whack on his head that he saw rockets; and possibly mistaking them for signals from the fleet, he hastily retreated towards the soldiers, followed by a volley of red-hot coals from the fireplace. Major-General Grey left on the fourteenth of September, having been at Homses Hole Harbor only four days. He had destroyed one brig and cargo, one schooner and cargo, four vessels with several boats, twenty-three whale boats and two salt works and took with him three hundred and eighty-eight stands of guns, a thousand pounds sterling, three hundred oxen and ten thousand sheep. The winter that followed was one of the most severe ever known. The snow in some places was up to the second-story windows and the ice was so thick that it was possible to drive with horse and sleigh to New Bedford. The British had taken all the stock and provisions from the Vineyard and the ice was so thick that the inhabitants found it impossible to purchase even shell fish. In December, after a terrible northeast blizzard, a school of black bass was found frozen in Lagoon Pond. People from all parts of the island hurried to the pond and cut tons of fish out of the ice for food, thereby saving many from starvation. During the war of 1812 a man named Dunham was out, with others in a small sized craft. They were overhauled by a British cruiser, an officer of which hailed them thus (putting hands to mouth trumpet-fashion: "Do you know that there's a war between the United States and Great Britain," The small vessel was obliged to strike her colors at once and was taken as a prize. Dunham said, that the first thing he did was to go below and with a sharp knife rip open his feather bed and scatter the feathers all around, "For I wasn't gain' to have them Britishers sleepin' on that bed that I'd laid on when I'd been duckin' at Gravelly Island," he said. A man named Marchant, during the War of 1812 was privateering, when his craft was discovered by a British man-o'-war, the captain of which hailed him thus: "Haul down them rebel colors and strike to the British flag, or I'll pour a broadside into you!" The captain of the small vessel replied: "Aye, aye, sir, I'll strike directly." At the same time he maneuvered in such a way as to bring his vessel into the position he desireda regular "Yankee trick"for by so doing he had the advantage and did strike indeed, for he opened fire and soon captured the British ship. Old Luce House, Vineyard Haven. 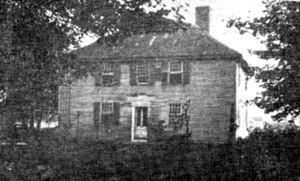 In 1782 Homses Hole was set off from Tisbury as a parish, and about 1790 the Proprietors Meeting House was built on the northwest corner of Main and Spring streets. This building became a Baptist church in 1804 when a Baptist society was formed. In 1837 a new church was erected, and was used until it was burned in the "great fire" of 1883. In 1885 the present Baptist church was built on the corner of Spring and William streets. The "great fire" which happened on Saturday night, August 11, 1883, was the worst disaster that ever occurred in the history of the town. The fire started in a harness factory that stood on the site now occupied by the Martha's Vineyard National Bank. Sweeping southward it burned every building on both sides of Main street as far as the old Luce house just above the fountain. In another direction it went as far as the Bradley house, and on both sides of Beach street as far towards the shore as the Branscomb house. The fire destroyed property covering an area of over forty acres. Seventy- two buildings were consumed, with a loss of over two hundred thousand dollars. This was a terrible blow to the community, but rebuilding was commenced at once. However, many beautiful old trees and the houses of "ye olden time," filled with family treasures and curios from all parts of the world, were destroyed. At the time of the fire, when many people were losing their property, one citizen returning to his home in another locality, was asked by a neighbor what had burned. He replied: "All of Main Street has gone." "Oh! Mr. Smith," the woman exclaimed, "Did the Baptist church burn?" "Yes," he answered. She began to cry and said: "Oh! my hymn book, my new hymn book; why did I leave it there last Sunday ?" The first Methodist preacher on the island was Rev. Jesse Lee, the founder of Methodism in the Northern States. He preached the first sermon at the Proprietors' Meeting House, February 4, 1795. The society was formed and incorporated March 7, 1833, as the First Methodist Episcopal Society. They soon erected the building on Church street now known as Capawock Hall, owned by the Masonic order. The second meeting house was built in 1845 costing $6,600. 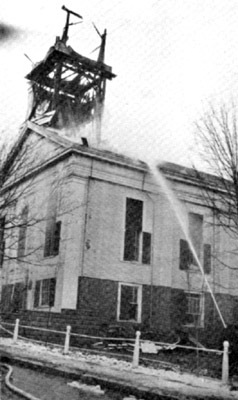 This church was burned December 31, 1922. It is interesting to know that the first Methodist camp-meeting on the island was held at West Chop by "Reformation John Adams" during July and August of 1827. The Vineyard Haven Unitarian Society was organized in 1898, and the Stevens Memorial Chapel was built in memory of the late Rev. Daniel Waldo Stevens, who worked with the sailors from 1867 to 1891. On Christmas Day, 1862, the first Episcopal service was held at Capawock Hall. Rev. John West conducted these services for several years. An "association" was formed in 1882, and the corner stone of Grace Church was laid in September of that year. The Congregational Society was organized in 1825, and held its first meetings in what is now the D. A. R. Hall. In 1844 they built their second church in which meetings were held until 1859, when it was sold to the Universalists, who in turn conveyed it to the Unitarians. In 1866, it became the Town Hall, and is now called Association Hall. Salt making was one of the earliest industries of the town and was carried on until 1850. The salt was used in curing fish to be shipped to foreign markets. In 1850 the following whaling vessels were owned in Vineyard Haven: the bark Malta and the ships Ocmulgee and Pocahontas. Captain C---- was a very sturdy man, not easily turned from his purpose. He was industrious and by his own efforts amassed quite a fortune. The following story is told about him. One day he was sick, yet determined to go fishing. His wife protested and even sent for the doctor. When the "Medicine man" arrived he pronounced the case measles. "There," exclaimed the captain, I knew that it was some childish thing. Pack my cannikin and I'll be off." Years ago there was a family living down the Neck. The father was sick and not expected to live. The son was obliged to go fishing every day, and whenever the father took a turn for the worse the mother would go out and wave a white cloth. This was done several times, the son rowing in as fast as he could. When he reached the house the old man always seemed better. One day the son was heard to say, after looking into the sick room window and seeing the father move: "Good God! not dead yet?" Captain L---- was not a very good provider. One noon when he went home to dinner there was nothing in sight but a kettle of water boiling vigorously on the stove. "Where is the dinner?" he asked. "I've done my part towards it," replied his wife, pointing to the kettle of water. Once upon a time a man named West went gunning at Little Neck. He carried an old flint-lock gun which sometimes refused to go off. He saw a flock of ducks coming, but fearing that the gun might not work he turned his back to the ducks and pulled the trigger. The gun went offso did the ducks. And straight she went to Heaven's gate." Knocked her back to Beelzebub." His friends reduced him to a skeleton. And now rejoice that he is dead." 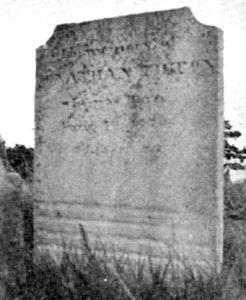 A few days after his burial the new owner of the plot was seen going through West Tisbury towards the Chilmark cemetery, and soon after it was discovered that the epitaph had been chiseled out. The stone is still standing and one can make out the original words. To Heaven she's sure there cannot go. 'La! Mr. William, so I can! Our island has its full proportion'." Homses Hole did her part in the Civil War by sending eighty-seven men into the army and twenty into the navy. One of the interesting facts of this time is that Captain Charles Wilkes, in command of the United States frigate, San Jacinto, was in the harbor, with Mason and Slidell on board as prisoners of war. One of the most interesting houses in Vineyard Haven is that now owned by the heirs of the late General A. B. Carey. This house was the home of Mrs. Mary Merry, commonly called "Aunt Molly." It is in a most picturesque location in the northern part of the town, and the grove near it is known as "Aunt Molly's Grove," a favorite resort for the young and sentimental. Aunt Molly was a descendant of Abraham Chase, who owned a large part of this region. Aunt Molly had quite a romantic experience. Early in life she married Nathaniel Ketchum, who later disappeared. After waiting until a suitable time had elapsed, she considered herself a widow and married Joseph Merry. All went well until, like Enoch Arden, Ketchum appeared. All parties concerned took the case for settlement to Isaac Daggett, the popular tavern keeper. He decided that Merry was to pay Ketchum a large sum of money, if Ketchum would leave the island forever. This was done. Stood on the Side of a Hill, Commanding the Sea"
Joseph Merry was a pilot by trade and used to sell the stockings and mittens which Aunt Molly made to the sailors on board the ships he piloted over the shoals. He always took his pay in silver, for she insisted on being paid in "hard money." Once he went out with an unusually large supply of goods. The ship was lost with all on board. When the news was brought to Aunt Molly, she exclaimed: "Oh! my socks; Oh! my mittens and money." After her death about five thousand dollars, in Mexican money, was found in old stockings and pudding-bags hidden under the stairs in the front hall. There is a tradition that at the time of the Revolution thirty British soldiers were quartered in her house. The old slate stone in the Crossways Graveyard records her death in 1843 at the age of ninety-four years and eight months. The old mill, which is attached to the Carey house, has an interesting history. It formerly stood on land near Association Hall, and was moved to where Luther West now lives. Within the memory of residents of the present time the mill was the prominent feature of the landscape, standing on Mill Hill, a lonely sentinel visible to homecoming Vineyarders as they sailed up the harbor. On February 21, 1871, the Government officially changed the name of the post office from Holmes Hole to Vineyard Haven. On May 1,1892, the township of Tisbury was divided and the part known as Vineyard Haven became the Town of Tisbury, but the government did not change the name of the post office. The most disastrous storm ever known on the island commenced on Saturday night November 28, 1898, and before daybreak of the 29th one of the worst northeast snow blizzards was raging. Vineyard Haven harbor was for many ships a port of refuge from the storm. The next morning found over fifty in a wrecked condition. The number of lives lost were few in comparison with the number of ships destroyed, because of the bravery of Isaac C. Norton, Alvin H. Cleveland, Frank Golart, Stanley Fisher and F. Horton Johnson. Cleveland and Golart, with Norton as captain, dared the wind and sea in a dory. They first went out to the schooner Hamilton, which was ashore near the breakwater, rescuing five sailors. The boat was unable to make the western shore so they went across the harbor, landing near the Standard Oil tanks. The half-frozen sailors were taken to Chadwick's blacksmith shop where they were revived sufficiently to be conveyed to the Marine Hospital. 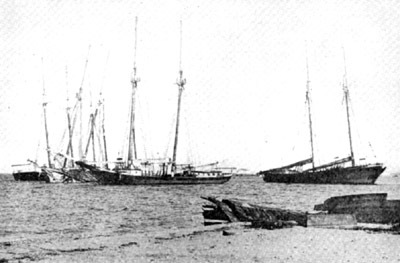 A schooner was ashore near the old Norris wharf at Eastville. The people on land could see the men in the rigging. 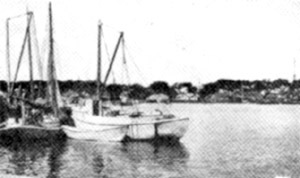 The dory was launched again, with Fisher, Johnson and Cleveland as crew, Norton in command. This time the dory was towed far to the windward of the schooner and let go by a tug. They managed to get to the Thurlow and save five men, one having frozen in the rigging. These sailors were taken to homes at Eastville where they received the best of care. By this time the storm was at its height, and against the judgment and protest of all, Norton, Cleveland and Golart went out the third time and rescued five more sailors, thereby showing the daring and bravery for which their forefathers were noted when they came to this cold and inhospitable climate and made their homes. Vineyard Haven Harbor, After the "Gale of '98"
A homeward-bound Vineyard Haven boy not many years ago reached Oak Bluffs and took passage on the bus, eagerly noting every familiar object along the route. A fellow traveler observing his evident interest kindly assumed the role of guide and as they proceeded pointed out all the places of interest. "This is called Eastville. That height on our left is known as Cedar Neck. On the left you can see the Marine Railway, and the imposing building yonder is the Government Marine Hospital." At this point the Vineyard boy's patience was exhausted and turning to his would-be guide he exclaimed: "Do you know where Cat Holler is ?" "No," replied the stranger. "Well, I do!" cried the native. A lady who was spending the summer at Vineyard Haven had heard that there were some very peculiar characters on the island among the resident population. Meeting one day a young lady bearing the name of our first Colonial governor, she addressed her thus: "I have been informed, ah, that there are a great many, ah, fools on the island. Could you tell me if this is true?" "Yes madame, was the reply, "there are, during the summer." The most important social event that ever happened in Vineyard Haven occurred Saturday afternoon, September 3, 1908, when from four to six o'clock Madame Lillian Nordica, the pre-eminent Wagnerian prima donna, gave a reception to her island people in the Methodist Episcopal Church. We say her people advisedly, as she was directly descended from the four most important families in early island history: the Nortons, Mayhews, Allens and Athearns. When it was learned that Madame Nordica, the most distinguished woman of Vineyard lineage, desired to sing to her relatives and friends, deep interest was aroused and arrangements were made for them to hear this magnificent woman in her prime. Captain G. D. L. Trask of New York, formerly governor of Sailors' Snug Harbor, was foremost among those who made the concert a success. Long before the hour set for arrival of Madame Nordica, the church was crowded and the streets so filled that her car had difficulty in approaching the edifice. At four-thirty o'clock she entered on the arm of her cousin, the late Captain James B. Robinson, bestowing gracious smiles on all in response to the plaudits and greetings of her admirers. A choir of fourteen voices selected from among the large number of concert and church singers in the vicinity gave with fine effect "The Dream of Paradise," Miss Annie L. Gonyon of Oak Bluffs rendering the opening solo. The Rev. Ira LeBaron, pastor of the church, then gave the address of welcome. The great singer opened her first group of five songs with a "Song of Thanksgiving," giving this and two others in English, one in French and the other in German. In the second part of three songs the wonderful "Weird Cry of the Valkyrie," roused the audience to the utmost pitch of excitement and enthusiasm as she seemed to be wholly voice. From that selection to the closing number the whole gamut of melodious sound and musical expression was heard. It was a great surprise to the famous singer when an American flag was presented to her by Captain Robinson on behalf of relatives and Vineyard Haven friends. To show her appreciation she immediately sang "The Star Spangled Banner," standing beneath its silken folds. 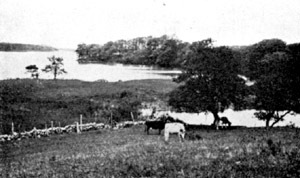 During the month of August, 1913, the people of Vineyard Haven gave a most interesting historical pageant of Martha's Vineyard, under the leadership of Mrs. Barbara S. Look, on the shores of Lake Tashmoo. A cast of more than a hundred and fifty people presented the following scenes from the island history: I. The Pawwaws, 1600; II. Gosnold's Visit to the Island, 1602; III. The Stealing of Epenow by Captain Hunt, 1614; IV. The Place on the Wayside, 1657; V. The Purchase of Homses Hole, 1664; VI. Grey's Raid, 1778, and the Liberty Pole. The principal actors were in most cases direct descendants of the persons they represented, and many of the costumes and properties were family heirlooms. This pageant was a great success in every way and will long be remembered. During the World War the town of Tisbury went "over the top" in every call. Those were days that stirred the people to do "their every bit." 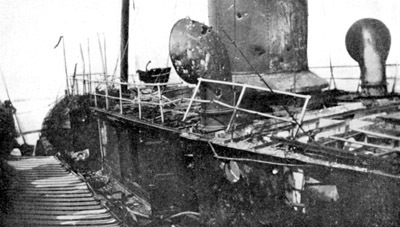 The most exciting incident was the bombardment of the tug Perth Amboy by a German submarine about thirty miles off shore. The crippled vessel was brought to the steamboat wharf and its wounded men were taken to the Marine Hospital. Community activities are held at Owen Park during the summer months under efficient leadership. Before leaving Vineyard Haven we should not forget Mrs. John R. McArthur, who through her generosity has done so much for the community in every way, even opening her bungalow year after year to music lovers. 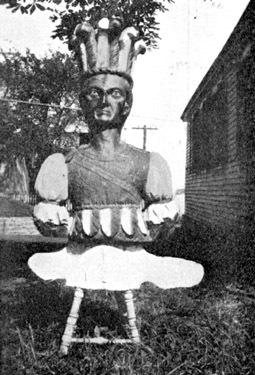 Pohoganot was a powerful cachem who lived on the south side of the island. His lands extended far to the east and his tribe hunted and fished over half the island. Pohoganot had instructed his son Tashmoo in the skill and power of tribal government. One day he told him that the time had come when he should found a tribe of his own to the northward. His mother Ahoma, a woman with a gift of prophecy, told her son that he would come to a large lake, full of fish, which was connected with the ocean. This lake was surrounded by a wonderful country of hills and valleys covered with thick forests, containing deer and all kinds of game. At the source of this pond he would find a spring of the purest water which would mark his journey's end. She gave him a pearl shell, telling him to drink of the pure water and give the spring his name. There build his wigwam and establish his tribe. Tashmoo and his followers marched across the lonely plains by well-known trails, past the lodges at Red Hill, across the Stepping-Stones at Webataqua, and plunging into the deep forest soon heard the murmur of the great pines, saw the rabbits, squirrels and deer. On they went until they heard the lapping of the water on the sandy shore of a pond. Then suddenly Tashmoo plunged his hands and face into a bubbling spring. Finding the water sweet, he took the pearl shell from his wampum belt and drank. Giving his tribe a drink, he blessed it in the name of the Great Spirit and named it Tashmoo. Comments? Questions? Corrections? Suggestions? Contact C. Baer. Back to Dukes County History.